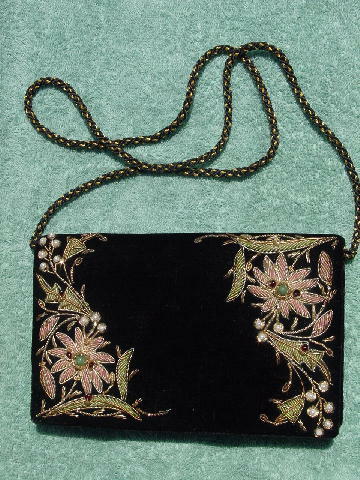 This vintage black velvet evening purse has a black and gold-tone woven 38" long shoulder strap. The front has a freeform flower and leaf design in metal and fabric cord. The cords are in pale pink-azalea, light lime sherbet, antique gold-tone, and platinum-tone. The designs are accented by faux pearls (the finish is coming off 4 of the faux pearls on the right side) and glass beads in jade and red-grape. There are accents (shiny gold-tone box-shaped beads) around the glass beads. 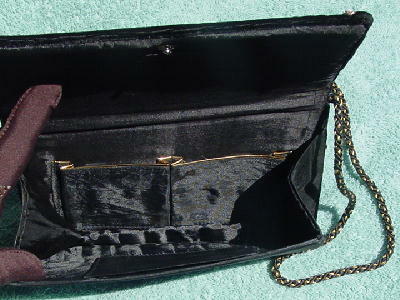 The interior is lined in black peau de soie and has two open back compartments, lined in a gold-tone edging. Hidden under the front flap is a snap closure. It's from a French model/actress who used it as her evneing purse when she modeled in Milan years ago.